World demand for biofuels is expected to expand at a 3.6 percent annual pace, reaching 115 million metric tons in 2018. North America and Central and South America will remain the largest regional markets, while the Asia/Pacific region grows the strongest from a relatively small base. Bioethanol will remain the leading biofuel. 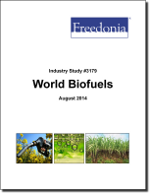 This study analyzes the 96.3 million metric ton global biofuel industry. It presents historical demand data for 2003, 2008 and 2013, and forecasts for 2018 and 2023 by product (e.g., bioethanol, biodiesel), world region, and for 22 countries. The study also considers market environment factors, details industry structure, evaluates company market share and profiles 31 industry participants, including Archer-Daniels-Midland, POET and Copersucar.